Marketing and Branding and Awarenss – Who Cares? | "Northern Crossings"
Marketing and Branding and Awarenss – Who Cares? Somethings are so strange that I have to comment upon them even when they break into where I was going with the previous blogs. We have been thinking about the depressing story at the end of Ecclesiastes, which by the way is so loved by secular folks who don’t care much about Christianity that we might want to figure out why that would be true. Ecclesiastes is branded as being intentionally depressing with the short saying “all is vanity” being translated as “all is absurd”. That is fatalism and nihilism and depressing. Anyway this latest digression is about perception and the idea of advertising and “raising awareness”. Raising awareness about mercy and missions is what we try and be about and showing how things like a pervasive fatalism or determinism, or the social justice movement may destroy the very nature of the awareness we are trying to raise. Two friends from Texas were able to sneak a large picture of themselves onto the wall of a McDonald’s restaurant, where it went undetected for nearly two months. 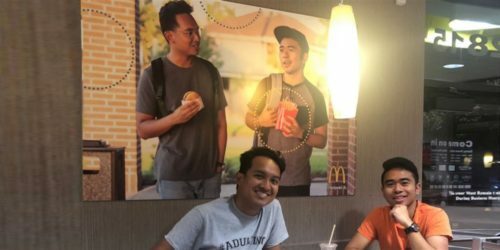 Jevh Maravilla detailed the unusual caper in a YouTube video entitled “We Became McDonald’s Poster Models,” which explained how he and friend Christian Toledo were able to pull it off. “All races deserve recognition, and I guess I did my part,” he said. They found a “natural environment” that looked similar to the locations used for the existing photos, and took a picture similar to the ones they had seen inside the restaurant. They edited the photo – adding more fries to the carton Maravilla was holding, as well as the chain’s logo and “I’m lovin’ it” slogan – and ordered a poster-size version. That was the easy part. The poster was delivered a week later, and Maravilla and Toledo set their sights on figuring out how to get it onto a wall at McDonald’s without being noticed. The best way to do this, they figured, was for Maravilla to disguise himself as a McDonald’s employee. Their plan involved purchasing a McDonald’s golf shirt at a thrift store for US$5.99. Maravilla also created a fake security badge identifying himself as a “regional interior coordinator” by the name of Jeff Bergara. “Sounds legit,” he said in the video. One mid-July night, accompanied by two other friends, Maravilla and Toledo put their plan in motion. The group brought the poster into the restaurant and leaned it against a wall – backwards, so as not to attract attention. Once they were sure nobody was watching, Maravilla took off his jacket to reveal his uniform and badge, complete with a tie and walkie-talkie. He then instructed his friends on where to affix the picture to the wall – capturing the whole thing on video. The friends were able to get out of the restaurant without anyone realizing what they had done. More surprising to Maravilla was that more than seven weeks later, the picture remained in place. “I really hope they’ll never take it down,” he said in the video. Maravilla’s prank prompted at least one other person to go public with a story of similar hijinks. Brynn Shuller of Burbank, Calif., tweeted that she and her friends slipped photos of themselves into picture frames for sale at a Walmart. The pictures were left alone for several months until the store received a new shipment of picture frames, she said. Does anyone else think this is weird? Evidently there was a blank wall at the McDonald’s, why? because no one cared to put anything there. Why raise awareness for a quarter pounder among folks who are there already eating them? Evidently these two guys noticed but their awareness was about something else – lack of Asians among the burger munching folks on existing signs. That is what they wanted brought to attention and their modus operandi is quite well done and the result is very professional and they could be professional marketers. They are amazed that their production is still up as far as I know, and I can’t help but think that the reason is because no one noticed. I don’t spend a lot of time marking the number of men or women or “other” that are munching burgers in advertisements and I don’t count race either. The last time I did it was with the Kroll Diners and their very Germanic demand that we, “sitz down und eat”. Thinking of some smeck fests that I have been to that was appealing. People will notice the stunt now because it is in the news but my focus is that at some point we get to the point where we don’t notice. Marketing and branding is to get us to notice and marketing and branding changes, which in my mind is silly. About the time people start to notice your brand some upstart in marketing will convince whoever in charge it is time to change it. Job security you know. Nike branding is amazing because the famous “swoosh” is ubiquitous even though no one knows what it is supposed to mean. The verbal brand is “just do it”. I guess I can get that, but the Kaepernick codicil is interesting too. “Believe in something”. That will resonate well with a generation that does not believe in much except their own superiority. The second part is even better – “Even if it means you have to sacrifice everything”. This to a generation that has never had to sacrifice anything. Even better, Kaepernick didn’t sacrifice anything except his quarterback position because he went 1-11. This awareness raising stuff is fascinating. The Budweiser Clydesdales were iconic but they have been retired. “Where’s the beef?” crossed into the whole culture but I don’t know what burger it was flogging, and “Momma Mia that was a spicy meatball” was fun but I can’t remember what sauce it was talking about. Marketing is expense and it surrounds us. I wonder if it ever answers the fundamental question – who cares? There was marketing and advertising in Jesus day. Roman procurators and governors and emperors advertised their achievements on monuments and statuary and walls. They still exist and excite the imagination if you can dig through 12 feet of old earth and garbage to find their scattered remains. Jesus advertised by simply preaching and declaring. “I am”. You may not think the branding worked, but He still “is”. NextHome Alone? Maybe Not In This Old House! The Missionary Impetus part 2.